Even though parts of the Pacific Northwest has been experiencing some sunny and warmer than expected weather, we are still on track to have some pretty good snow pack this winter. There early storm that brought snow to the higher elevations over the past week have offered some pretty spectacular views as well as some angst to get the winter started. This photo was actually taken last winter and is just a few yards from one of the ski runs at Mt. Hood Ski Bowl. Sometimes you can get some pretty cool photos by just wondering just a few feet from the hustle and bustle of the winter traffic. I actually went out looking for this type of photo and ended up spending several hours snow shoeing through the powder until I was satisfied. 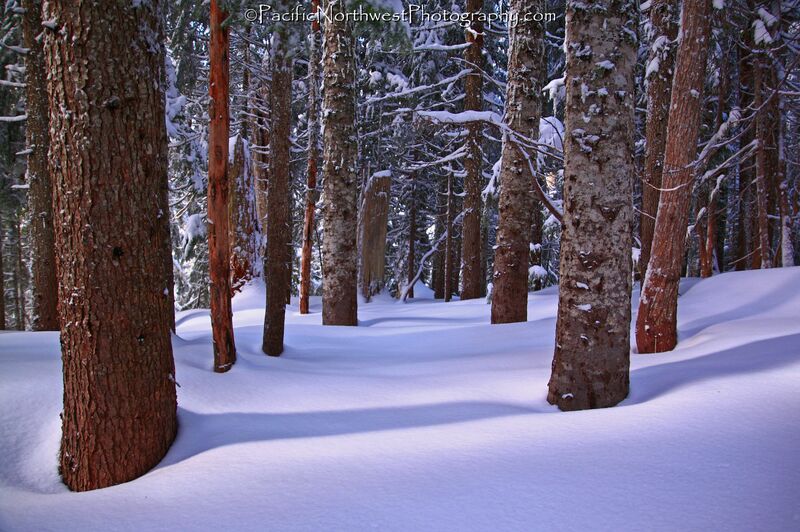 The only thing that makes it really difficult is if you plan on snow shoeing with your camera attached to a tripod. This makes it especially difficult if you have to use your poles to keep your balance as you trudge through deeps pockets of snow. To avoid this type of hassle or pitfall, I suggest that you instead remove your CIR-PL and turn on the IS. You then just need to plan on utilizing your histogram in order to ensure that you’re only saving the photos that aren’t blurry, shaky, level or over/under saturated. Leaving your tripod behind allows you more time to explore and really put on some miles. However, sometimes I still pack my tripod and store it in my pack and then only take it out when I come to a spot that I really think deserves it. Practice can sometimes make perfect and learning how to take a good shot without using your tripod can surely help make that happen. [/caption] Every once in a while you’re lucky enough to be photographing the landscape when you look up and notice that the moon is in the distance. However, I’m never lucky enough to witness the moon within a close proximity of my subjects that I may be photographing. Whenever I’m able to include the moon in some of my photos it’s always pretty far away and hard to notice unless I use my telephoto. I can only imagine the day that the moon is enormous and very close where I can take a picture of a snow capped mountain or the ocean at sunset standing side by side. Until then, this is the best that I can come up with. While I was returning from my snow-shoe trip in the Mt. Hood wilderness I decided to snow-shoe inside the deep forest and look for some descent photography opportunities but then I noticed that the moon was just above the trees. Luckily the sky was still a perfect shade of blue and the clouds were allowing me several photo opportunities without them in the frame. [/caption] The trail that follows along Herman Creek that cuts through the cliff walls along the Columbia River Gorge displays some of the most awesome scenic views in the Gorge. There are also several additional trails that you can choose from that offer difficult hikes. The Gorton Creek trail will take you directly over the Gorge 2700 feet above the Columbia River or you can also hook up with the Pacific Crest Trail within just a few miles on a different trail. However, the Herman Creek trail is my favorite since you follow through the steep walls of the Gorge and takes you along many viewing areas of the forest along with spectacular views of the creek. During spring and early summer you can photograph some of the most beautiful flowers that dot the trail. I took this shot on 6/3/10 at 10:48am during a fairly overcast day and when the water levels were extremely high. I was standing on a bridge that is just just .4 miles off the main Herman Creek trail. I like this shot because I am standing directly over the creek which allows me to encompass the water and the vegetation that looks as though the river is bubbling right out of the forest. I was using my Canon EOS Rebel T1i along with my Canon 18-55mm kit lens. Since I wanted to get the flowing motion of the river along with a long shutter speed I had to use my ND8 filter along with my UV and warming filter. Normally I only use my ND4 but the glare was still pretty intense due to the amount of water and the fact that it was traveling at such a high speed. A slower moving river or waterfall is much easier to photograph than one that is moving much faster. In fact, I was only able to set the shutter speed to 4 seconds. I had the camera mode set at shutter priority and the aperture was at F22. The F stop was at F22 since I had the ND8 filter on the lens which only allowed a small amount of light through the lens. I also set the ISO at 100 and the white balance at -1.3 due to the glare of the water. Taking photographs of fast moving rivers and waterfalls really requires you to master the art of utilizing and understanding light and your subject. I can spend hours changing my filters and settings in order to take the perfect shot. However, I am rarely disappointed when visiting the Columbia River Gorge. The photo opportunities are endless. I normally avoid the Gorge when the water levels are low and if the vegetation is still sparse or too dry due to the time of year. Late summer and winter isn’t the best time to get the best shots. [/caption] Spending only one day at Crater Lake National Park creates a very sad situation since I could spend over a week hiking, photographing and most importantly seeking out all of it’s treasures. I haven’t been to Crater Lake since 1993 but this time was especially awesome. There was plenty of snow surrounding it’s north facing banks and the entire Southern Oregon Cascades had well above 75% of their average. However, this did mean that only half of the Rim drive was open. As soon as I got out of my car at Merriam Point, I was quickly photographing the lake. I couldn’t believe how blue the lake was and how clear the skies were. I could see Mt. Shasta and Mt. McLoughlin to the south and Mt. Thielsen, Baily, Diamond Peak and two of the Sisters in the north. Mt. Scott, which is the tallest mountain in the Park, standing at 8929 ft, had a lot of snow on it’s north side but hardly any on its south side. There were also several other smaller mountains still covered in the snowy white stuff. This truly showed just how much colder and shadier the northern flanks of the Cascades can hold their snow but how soon their south flanks lose their snow pack. Crater Lake had also fallen victim to this vicious cycle since the northern rim, which was facing south was bare but the southern rim, facing north had snow reaching all the way to the lakes edge. The rim drive road was open north from the Cleetwood Trail and eventually ended south at the Crater Lake Lodge. We took the hike down the Cleetwood Trail and I was tempted to go for a swim but eventually I decided that my shorts wouldn’t dry fast enough. Going up to my knees was good enough at the time. We also hiked up towards 8,054 ft Garfield Peak but eventually had to turn back due to the snow on the trail. Maybe it was better that this was only a day trip since most of the trails were closed as well as half the drive around the lake. However, if I had brought my snow-shoes I could have again spent over a week here. I took this shot while hiking on the Garfield Trail. I made sure and lowered my camera enough so I could get the snow in the foreground. This picture truly shows how much snow was on the north side and how much less was on the side facing south. You can clearly see Wizard Island and Llao Rock standing behind it at 8,049 ft. You can just barely see Mt. Thielsen just to the right of Llao Rock. To get this shot I had the exposure at auto and set the ISO to 100. I never had to use my tripod all day since I was there during daylight and there were limited shady areas. However, I did set my white balance to around -1 for most of the day. The F stop was at 6.4 and the shutter speed was at 1/83 second. I was using my ultra wide-angle lens and had the focal length at 21mm. It was impossible for me to get the entire lake in view even when using my 12mm wide-angle lens. This place clearly shows just how limiting any type of lens is when trying to capture the entire lake in its view. 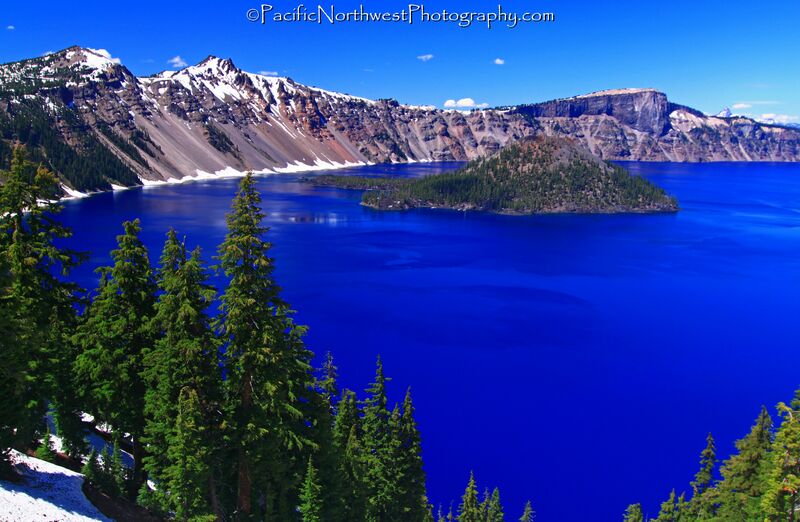 Crater Lake NP is a must see for any photographer as well as any hiker or nature lover. I am all three so I won’t wait another 17 years before returning again. [/caption] One of the best things about the Pacific Northwest Cascades is that you can always find a great place to view the volcanoes that span the Cascade mountain range, as well as the enormous stands of forest. Some of the best things to do when taking in the views is to gaze out across the enormous span of forest and look down and try to find some of the meadows and alpine lakes. The geology is so diverse and complicated that it’s hard to imaging just how violent the Cascades were during their earliest days. It’s also hard to imagine that some of the only alpine glaciers, within the lower 48 states, are found in the Cascade range. 97% of them are found in the North Cascades National Park alone. It’s well worth taking the time to hike some of the trails that they offer and take advantage of it diverse geology and awesome splendors. I took this shot of mt. Jefferson in the distance using my ultra-wide angle lens in order to show just how impressive the forest and the foothills are. The focal length of my 12-24 wide angle lens was at 14mm. I set the ISO at 100 and the F stop was at F-6.4. The exposure time was at 1/100 second and I didn’t use my tripod to take this shot. The clouds helped create some great pictures as well as provide some great personality of the forest. I had to have the F-stop below 7 since the sun was hidden behind the clouds during this photo. I have some shots with more sun but it caused too much glare and also the photo to be somewhat over-exposed. Having clouds in your shots always creates a much need personality of the Cascades. This is especially true if the sun is too bright and the sky is somewhat hazy. [/caption] Silver Falls State Park is Oregon’s largest State Park and has the highest concentration of waterfalls in the state. 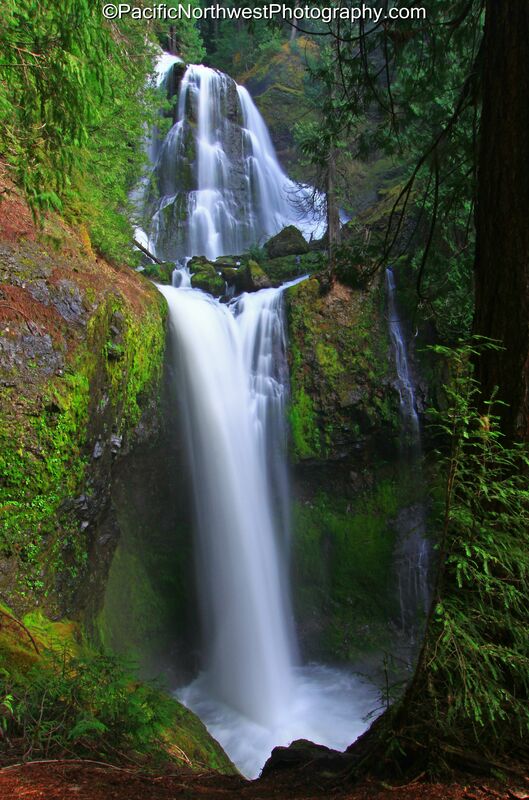 The park boast’s 10 waterfalls and they’re all within the hiking trail. I always try to start out as early as I can in the morning in order to take advantage of the early sun and the lack of crowds. By noon, there can be hundreds of hikers crowding the trail, which can really frustrate any photographer trying to capture a serene shot of the falls. This is especially true since some of the trails go directly under the falls. Five of the waterfalls are over 100 feet and if you go in early Spring they’re swelling with intense amounts of water thundering towards the basalt rocks below. The falls can be really empty in summer, winter and fall, so I recommend spring. However, some of the vegetation is still not out yet. We’ve been experiencing some of the strangest springtime weather. Normally the waterfalls throughout the western slopes of the Cascades are completely covered with all of the neon greens. I’m assuming it’s due to the late snow and colder weather that we’ve been receiving. At this rate I hope that the waterfalls stay swelled along with lots of vegetation. I spent the entire day photographing at the park. I started at 7:00 am and finished around 6:00 pm. I tried to capture the early sun in the morning and the soft sun in the evening. Since the waterfalls are deep in the canyon, the sun is usually pretty soft throughout the day. Lower South falls is one of my favorite falls to photograph. The waterfall is 93 feet high and the trail goes directly under the falls. You can get a great shot from either side and since the trail travels up several hundred steep steps you can sometimes get a great shot from high above the falls. I took this shot around 11:00am and I used my ND8 and my warming filter. I set my exposure mode to shutter priority at 1 second. The F-stop was set at 20 and the ISO was at 100. I was using my 18-55mm lens and had the focal length at 43mm. I was also using my tripod. Due to the popularity of the park, I would recommend going on a weekday and getting there as early as possible. Weekends can be busier than a parking lot on Christmas eve. May and June are also the best times to go there. [/caption] I’ve been posting so many photos from my recent hikes along waterfalls that I decided to dig deep into my bag and post one of my all-time favorite pictures. Since I’ll be taking many more photos of the green vegetation and waterfalls this Spring, I wanted to include something just the opposite. This photo was taken last October and was taken in the late part of the afternoon. Lost Lake is about 25 miles south of Hood River and follows a windy but well maintained paved road. There are several views of Mt. Hood along the way as well as some of the best Fall colors available. There is an awesome hiking trail that goes around the lake, which is about 3.4 miles. Three are several viewing areas along the lake. Since you aren’t allowed to have motorized boats on the lake, it mostly stays calm. There is also a great hike that takes you to Lost Lake Butte, with an elevation of 4468′. It has an elevation gain of 1300′ and is about 3.8 miles round trip. I believe that most of the trees in the area are old growth. The summit includes some of the most spectacular views of Mt. Hood and provides an absolute clear view of the mountain. This shot was taken on 10/21/09 and I used my auto exposure without using a tripod. I used my 18-55mm lens and set the focal length at 41mm. The F-stop was at 5 and the ISO was at 100. I was using my warming filter and my CIR-PL filter as well. Lost Lake has a very nice day use area as well as a very clean and well kept campground. They also rent cabins and I believe it also has a lodge. There is a general store and showers. They also rent canoes that you can take out on the lake. 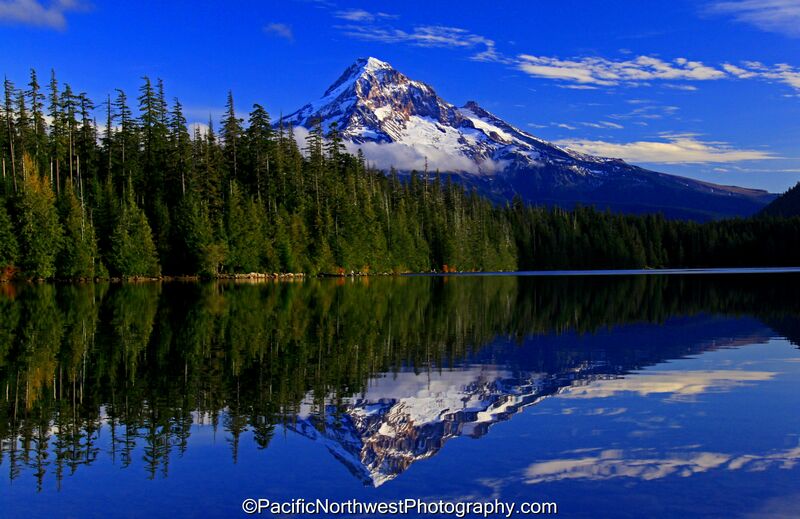 I hope to get a chance to visit Lost Lake before the end of May so I can get some great shots of Mt. Hood and all of its snow from our recent snow accumulations this Spring. [/caption] One of the most majestic and massive waterfalls that I’ve seen in a long time. 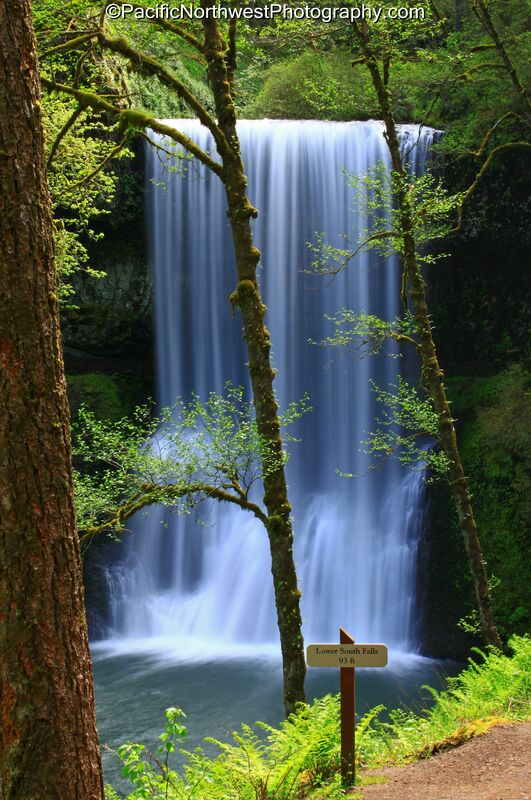 It isn’t nearly as tall as Multnomah Falls but this 3-tiered cascade starts with a hidden 50-foot falls, spreads across a 70-foot fan and finally drops 80 feet into a huge rock punchbowl. However, the last part of the waterfall isn’t within view due to the trees and the sheer drop next to the falls. The waterfall is so wide towards the top that you could park a semi from end to end and still not block the falls. The trail starts at about 15 miles north of Carson, WA at a primitive and quiet parking area. The last few miles are on a gravel/dirt road with some potholes. The best part of this hike isn’t just to the waterfall. If you backtrack about 1/2 mile there is another trail that takes you to the top of the falls. This puts you at 2370′ and right on top of the falls. There are several viewing areas at this elevation and the panoramic views are incredible. The forest is also especially beautiful and quiet. 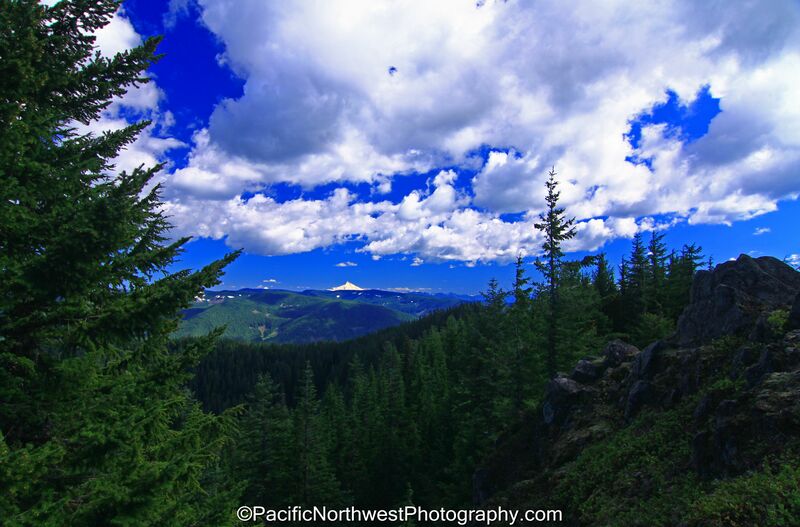 If you’re a fan on my business facebook page at PNW Photography LLC, you can see several more pictures from this hike. There is also another great little creek that flows down just before the main falls that a bridge crosses. I’m pretty sure that it’s a natural spring since the upper trail never crosses this same creek and it doesn’t seem like it forks from Falls Creek. This photo was taken at about 4:00 in the afternoon. I returned to the falls for a second time in order to avoid most of the glare from earlier in the morning. To get this shot I used my 12-24mm wide angle lens. I set the focal length at 16mm. I had my warming filter and CIR-PL attached to the lens. I set the ISO at 100 and the F-stop was at 16. I set the Exposure Program to Shutter Priority and set it at .5 seconds. I used my tripod in order to avoid camera shake. Again, a lot of the vegetation still wasn’t out which made for some of my shots to seem like there was some brown vegetation. Many of the wildflowers were starting to come out but I would give it another week or so before the rest of the neon greens break out. I’ll be returning once all of the colors are out.